The health benefits from eating beef may be one of the protein’s most powerful, yet frequently unacknowledged, attributes. Indeed, beef merchandisers are facing the challenge of generating activity from a large base of wellness-conscious shoppers who typically perceive the protein to be less healthy than such alternatives as chicken and turkey. While beef still is the leading supermarket meat department revenue generator, with 2017 sales of $24.9 billion versus $12.5 billion for chicken, chicken had pound sales of 5.3 billion, higher than the 5.2 billion of beef, states the Power of Meat 2018 report. Power of Meat 2018 is published by the Arlington, Va.-based Food Marketing Institute and the Washington, D.C.-based Foundation for Meat & Poultry Research & Education and prepared by 210 Analytics LLC, a San Antonio-based market research and marketing strategies firm. Hy-Vee’s beef merchandising strategy includes using its registered dietitians and point-of-purchase materials to educate shoppers in-store. To alter that outlook, Hendricks said it is crucial that marketers consistently work to educate shoppers on the health attributes of beef. Many meat department shoppers, however, are unlikely to notice signage that spotlights nutritional claims, she said. Instead, merchandisers can educate consumers away from the meat case, such as with print ads, newsletters and phone apps, as well as from in-store cooking demos and by training store associates to speak intelligently about beef’s positive elements, she noted. That also includes using such vehicles as mobile devices, websites, e-mail and social media, said Kara Behlke, director, health and wellness strategy, for St. Louis-based Schnucks Markets Inc. Retailers, for instance, can note in their communications that a 3-ounce serving of beef provides more than 10 essential nutrients including protein, iron, zinc and vitamins B12 and B6, she suggested. “Once they share the story and message, retailers also must have a variety of beef cuts to choose from to make lean beef an easy solution,” Behlke said. Creating a healthy image, however, can be challenging and will require a commitment to education and repetition, she agreed. As a result, it is important to first understand the target consumers’ shopping habits along with the information they are seeking and the products, services and selections they prefer, Behlke stated. Retailers can garner data through such measures as online shopper panels, focus groups and customer shop-alongs, she noted. Indeed, convincing shoppers that lean beef is just as healthy as other lean proteins remains a challenge, says Jason Pride, vice president of meat and seafood at West Des Moines, Iowa-based Hy-Vee Inc. He noted that Hy-Vee follows a multifaceted beef merchandising strategy that includes using its more than 170 registered dietitians to educate shoppers at the point of purchase in aisles, and including beef in cooking classes and demonstrations, samplings, store nutrition tours and other events. In addition, the retailer highlights how ground beef can be a great source of nutrition as a first food for children, Pride said. 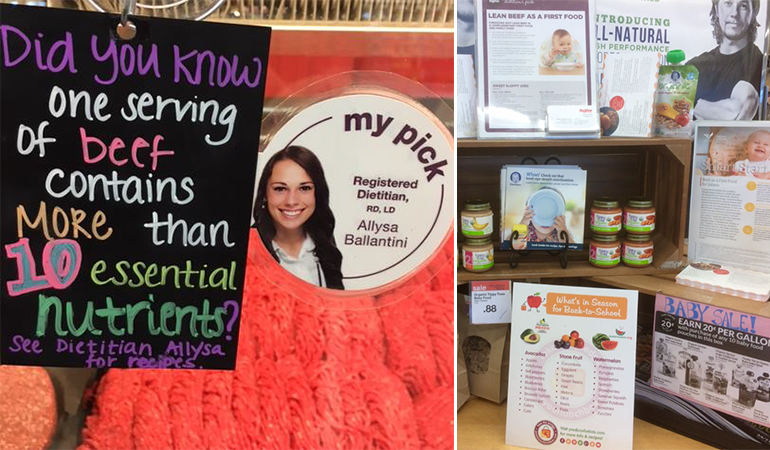 Measures include the use of shelf talkers in the baby aisles and meat department; one-on-one discussions with shoppers; and describing in baby food prep classes how beef supports healthy growth without excess weight gain, supports brain development and provides healthy gut bacteria to help infants’ immune systems. It also is important to communicate to consumers that there are several lean beef options that can fit into a healthy diet, said Heather Steele, registered dietitian at Tahlequah, Okla.-based Reasor’s Foods, which educates shoppers on beef attributes during store tours, via social media and at events. Prominently spotlighting beef's health attributes also is crucial as many merchandisers incorrectly assume that shoppers are aware of the benefits, added Anne-Marie Roerink, 210 Analytics principal.